Forests and trees contribute to the four dimensions of food security and nutrition (FSN) in multiple ways: They provide food, timber, medicine and energy. They create income and employment in rural areas. In most developing countries one of the biggest contributions of forests to FSN is the provision of energy to cook food and boil water: About one third of the world population relies on wood fuel for cooking and water sterilization. But the current unsustainable use of wood in smoky kitchens is causing 4.3 Mio deaths per year (WHO 2015) and the unsustainable harvesting practices increasingly cause forest degradation. Alternative energy sources for cooking and boiling are far away from being accessible for most of the rural population and if they are, they are not affordable for the poor. Using wood for energy means decentralized and affordable access to cooking fuel and it means employment and income for a large portion of the population. Charcoal production for urban markets for example is a major income source for the rural population, especially in times when agricultural harvests are low. Improving the wood energy value chain through forest landscape restoration (FLR) approaches as promoted by the AFR100 initiative is an opportunity for rural development, income and improved food utilization. Developing organized wood energy value chains reduces the pressure on natural forests and restores ecosystem functions needed for agricultural production. More efficient charcoal production technologies as well as less smoke producing cooking facilities improve the rural living conditions. 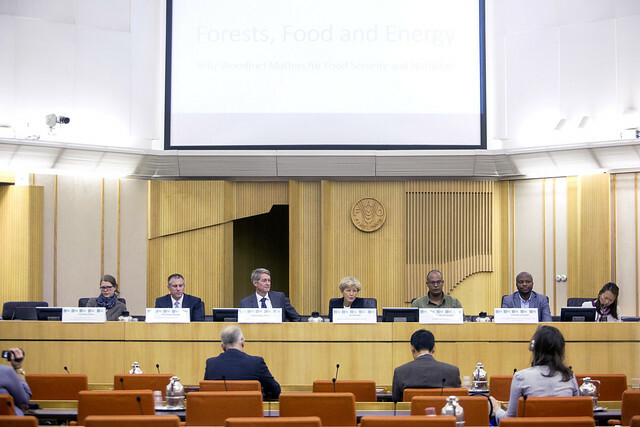 The side event will present the relevance for and existing challenges and opportunities in the wood energy sector in relation to food security and nutrition illustrated by country examples in Africa. A panel of experts will discuss conditions and options for a sustainable production of wood fuel that can meet the demand for a reliable and affordable energy source while at the same time contributing to better health and improved food utilization. Conditions and options for a sustainable production of wood fuel that can meet the demand for a reliable and affordable energy source while at the same time contributing to better health and improved food utilization. Forests and trees contribute to the four dimensions of food security and nutrition (FSN) in multiple ways: They provide food, timber, medicine and energy. They create income and employment in rural areas. In most developing countries one of the biggest contributions of forests to FSN is the provision of energy to cook food and boil water: About one third of the world population relies on wood fuel for cooking and water sterilization. However, household air pollution remains to be the single most important environmental health risk worldwide; cooking with solid fuels, including woodfuel, is implicated in 4.3 million deaths each year (WHO 2016) and the unsustainable harvesting practices increasingly cause forest degradation. If managed sustainably, woodfuel can offer benefits as a renewable and affordable energy source, reduce pressure on natural forests, and restore the ecosystem functions needed for agricultural production. Key message: Woodfuel has a major role in achieving food security and nutrition of one-third of the world’s population. With improved forest and tree management, it provides a renewable, affordable and reliable source of energy to prepare food. Food insecurity and a high dependence on woodfuel as a primary cooking fuel are characteristics common to vulnerable groups of people in developing regions. With adequate policy and legal frameworks in place, woodfuel can be a sustainable, renewable and profitable source of energy for both rural and urban areas. The widespread availability of woodfuel, and the enormous market for it, present opportunities for employment and for sustainable value chains, providing further rationale for promoting this source of energy for cooking. Concepts need to include a formalization of the market and the promotion of efficient energy technologies to reduce health and climate risks associated with the burning of woodfuel. Furthermore and when secure forest tenure rights are provided, the benefits of people involved in sustainable woodfuel value chains (from sustainable production to efficient use) can be an incentive for the protection of forests and the restoration of degraded areas in the context of forest and landscape restoration. Integrated Landscape approaches need to take into account the importance and potential of sustainable woodfuel for subsistence and livelihoods of local people as well as the ecological services of forests and trees provide at national, regional, or landscape levels.